Inciting A Riot: Yeah Organic!!! Boo Weirdness!!! I've been working at the cafe of Barnes and Noble for a few weeks now, sadly enough. Though it's been an interesting experience, I don't know that there's been anything more disturbing than the package the Horizon brand organic milk comes in. In large bold letters it states that the milk does NOT need to be refrigerated. I mean, yeah for us selling organic milk, but shouldn't milk spoil? Like, very soon after it comes out of the cow? Shouldn't milk, you know, not have anything in it that would keep it lasting that long? 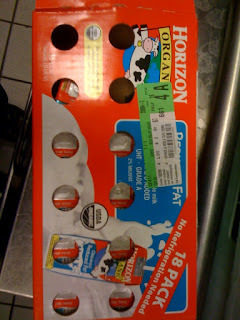 The Horizon website states that the reason it can keep the milk at room temperature is "special packaging." Yep, I'm still disturbed.